FORMULA FEST Ford explains the process for cloning a Lifetime movie to Fraser. In the medical drama Extraordinary Measures, we observe two human beings in the advanced stages of a generally irreversible condition. 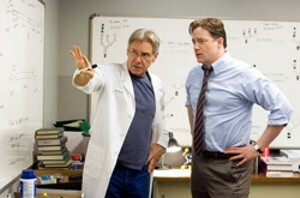 That’s right: Brendan Fraser and Harrison Ford. Their careers are so code blue they’ve stooped to taking paycheck roles in a disease-of-the-week TV movie. It just happens to be playing in theaters. Don’t let that fool you. This is a TV movie. It’s the debut release from recently formed CBS Films and would fit right in on the Lifetime Channel. 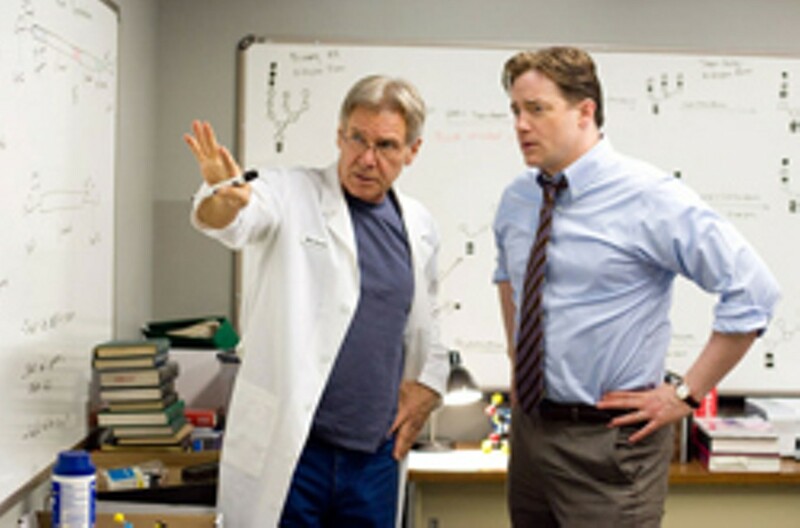 Based on Boston Globe reporter Geeta Anand’s book The Cure: How a Father Raised $100 Million — and Bucked the Medical Establishment — in a Quest to Save His Children, the film tells the story of a father who ... well, you get the idea. Fraser plays John Crowley, an executive at Bristol-Myers Squibb whose two youngest kids suffer from Pompe’s disease, a rare, horrifying form of muscular dystrophy that usually kills its victims by the age of 9. At the start of the story, his daughter (Meredith Droeger) has just turned 8. She is confined to a wheelchair, reliant on a breathing tube and getting weaker by the day. One of many ways in which the script plays fast and loose with the facts is in amping up the drama by having Crowley wait until this late date to get Googling. The minute he does, of course, he learns of a researcher named Dr. Robert Stonehill who’s working on an enzyme with the potential to arrest the progress of the disease. The desperate dad hightails it to Nebraska, only to find — are you sitting down? — a colorful character. Crotchety, ill-tempered, and born without people skills, the scientist initially blows Crowley off. This being the sort of movie it is, however, the two soon resolve to go into business together. Fraser’s character will raise money; Ford’s will remain crotchety, ill-tempered and eccentric. But with better equipment and a staff. The screenplay by Robert Nelson Jacobs streamlines the story of their startup into fairy-tale scenes in which the mismatched pair meets with venture capitalists and a giant biotechnology firm. Talk about stimulus packages. People can’t throw piles of cash at them fast enough. From here on, we’re in race-against-the-clock mode, and who isn’t going to root for the drug to be developed and approved in time to save Crowley’s children? Never mind that the outcome’s a foregone conclusion (see the title of Anand’s book). Or that the father didn’t so much buck the medical establishment as join it. Never mind, for that matter, that Dr. Robert Stonehill doesn’t exist. In reality, the cure was developed by Dr. Yuan-Tsong Chen and his colleagues at Duke University. Who can say why director Tom Vaughan felt it necessary to turn him into Dr. Indiana Jones? I think we all can. Extraordinary Measures is button-pushing baloney from start to finish and features performances by two actors at the bottom of their games. No one wants to see children suffer. It’s in our DNA to celebrate when someone defies the odds and saves them. The movie does a disservice to John Crowley and his indisputable achievement by jettisoning inconvenient truths and twisting his story into a feel-good fable. Even the picture’s happy ending is an exercise in fact fudging. Treatment for Pompe patients currently costs $300,000 a year for life, and most insurance companies in this country refuse to pay for it. While a fix exists, American children continue to die, a tragic reality the film is too busy tugging at heartstrings to bother disclosing. That’s a sick system — and a cure, unfortunately, is nowhere in sight.